I. 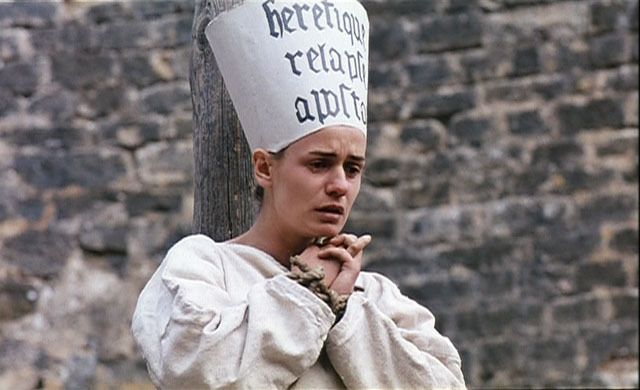 The Battles begins with Jeanne having had her angel visitations already, trying to convince local government to take her to the king, and halfway through the film gets to the battles she led against the English. II. 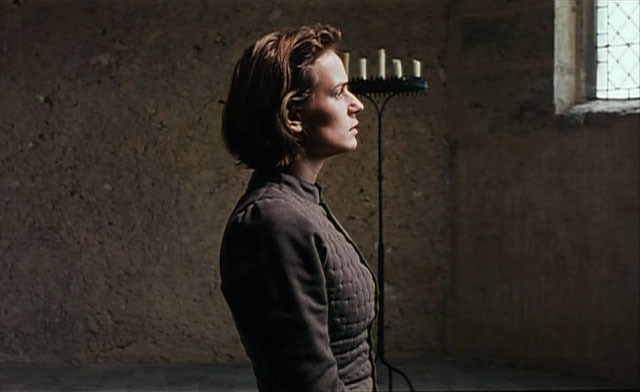 The Prisons is half battles (which is good; we didn’t get enough battles in part 1) and half British prisons (with hardly any of the trial/execution scenes that Dreyer would focus on). All set 1429-1431, except for an odd intro in 1455, with Jeanne’s aged mother, a nun, telling of her daughter’s unjust execution. It’s a Rivette film, all right. Long shots with medium natural lighting, deliberate camera movement, same typeface as always on the titles, brief blackouts between scenes, same list of collatorators in the credits. Quite a follow-up to La Belle noiseuse… I’ll bet nobody saw this coming. 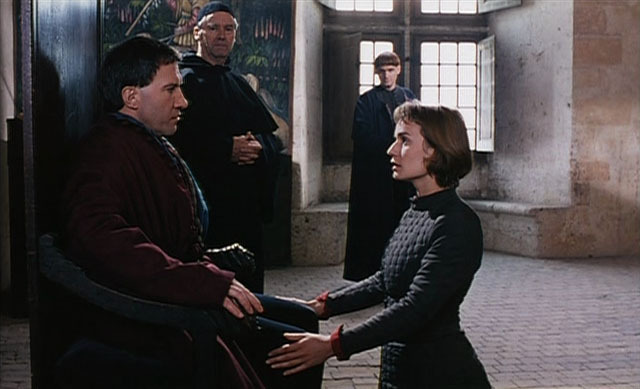 It works very well to Rivette’s strengths, though, and stays focused on Jeanne and her quest without gimmicks and without getting caught up in the scale of the story and the hundreds of side characters. 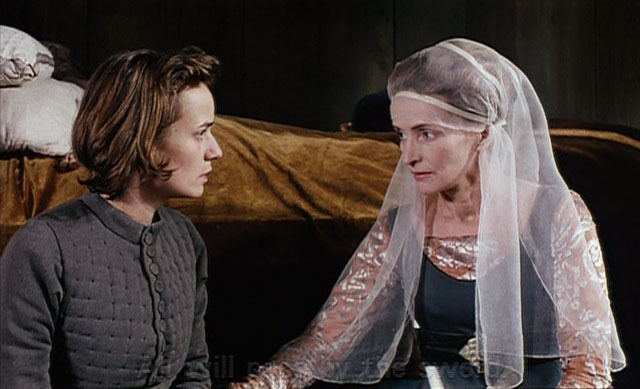 Sandrine Bonnaire, a decade after Vagabond and a year before The Ceremony. I didn’t recognize anyone else besides a cameo by Edith Scob. 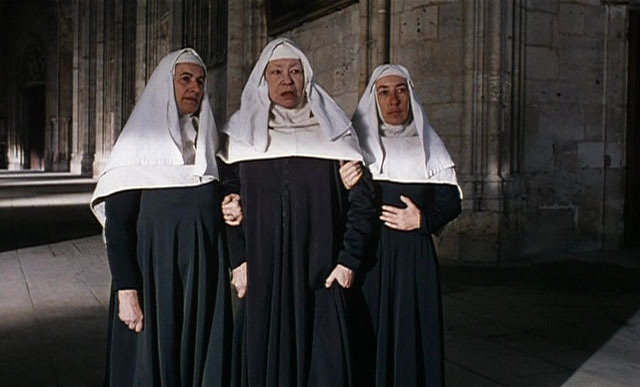 IMDB says Jean de Metz, the guy who leads her to the king’s court, was in Hurlevent, King Charles (André Marcon) is appearing in Rivette’s new film, and Quentin from Out 1 played Pierre Baillot (who was that?). Joan is charismatic and persuasive, but acts realistic. Her supernatural visions aren’t shown – we know Rivette isn’t above showing supernatural visions, but here he has Jeanne speak of them regularly without portraying them as a reality to the audience. …this is a materialist version of a story that offers no miracles, though it does offer a pertinent attentiveness to gender issues (such as the nervousness and sexual braggadocio of the soldiers who sleep beside Joan) and a Joan who’s girlish as well as devout, capable of giggling as well as experiencing pain; when she wins over the dauphin the scene is pointedly kept offscreen, and when she’s interrogated by priests about her faith she could almost be a graduate student defending a dissertation. As Rivette and Bonnaire present her, Joan suggests a novice movie director protected by a seasoned crew that humors her as much as obeys her. (Army life in this film is more sitting around than fighting; in this respect it’s like a film shoot.) She doesn’t do miracles; she just uses common sense and takes the initiative.